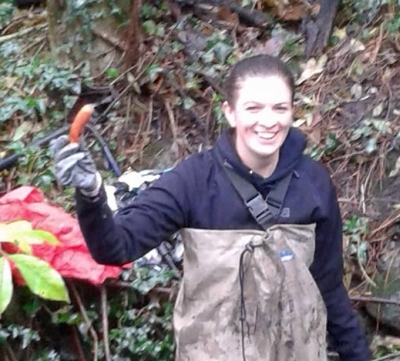 On Saturday (14 November) we continued our clean-up of the iconic River Taff, by Western Avenue, and surrounding areas. Despite the rain, there was a terrific turn out of eager volunteers! It’s an area we hadn’t visited for a while, and there was plenty to keep us busy. We managed to collect the full set of shopping trolley, bicycle (two, in fact) and traffic cone, along with “branded” litter from the nearby fast-food places — although, to be fair, much of it was quite old, and had been thrown in fairly inaccessible places, so it seems that someone is doing fairly regular general sweeps for routine litter. The oddest find of the morning was probably a plastic sausage. 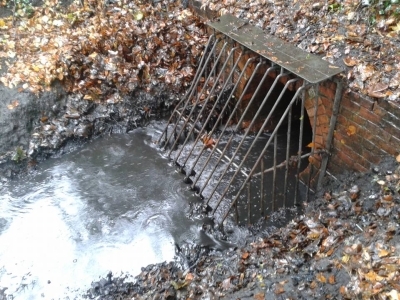 We also managed to unblock a grille over a culvert on the feeder stream that runs from Tesco under the old black-and-white gatehouse into the Taff. The grille in the photo below was blocked almost to the top before we started work! 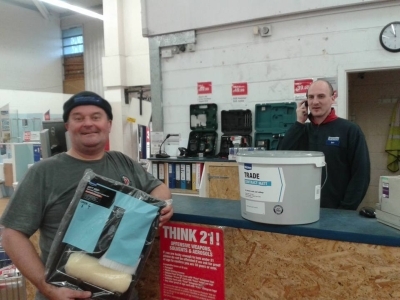 And we returned a large expensive trolley to Wickes, who kindly donated 15 litres of paint and a roller- set that will go to Cardiff Men In Sheds to help paint the first Shed at Dusty Forge Ely, in partnership with Action in Caeru & Ely (ACE). Partnership working in Cardiff for everyone’s benefit!